he war in Europe is long over, but the Blackhawks squadron is still together. Now, straight from an acclaimed run in ACTION COMICS WEEKLY, Blackhawk comes to the pages of his own monthly title. The Blackhawks move state-side to work for the C.I.A....just as the U.S. Congress opens its investigation into Communism and the comic book industry. What on Earth can that have to do with the worlds greatest aviators? The answer will startle and amaze you, not to mention pose a danger that will place Blackhawk smack dab in the crossfire in Part 1 of All in Color for a Crime. 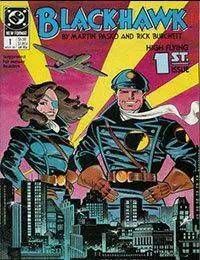 And, if that werent enough for a first issue, youll also learn the secret of the real Lady Blackhawk.